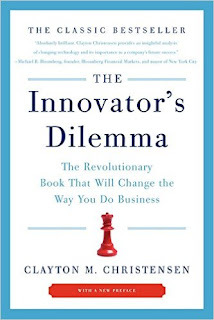 This is just a few passages from the book that I underlined and then took down in a notebook as I re-read The Innovator's Dilemma: When New Technologies Cause Great Firms to Fail by Clayton Christensen. The research reported in this book supports this view: It shows that in the cases of well-managed firms, such as those cited above, “good” management was the most powerful reason they failed to stay on top of their industries. Precisely “because” these firms listened to their customers, invested aggressively in new technologies that would provide their customers more and better products of the sort they wanted, and because they carefully studied market trends and systematically allocated investment capital to innovations that promised the best returns, they lost their positions of leadership. Organizations have capabilities that exist independently of the capabilities of the people who work within them. Organizations’ capabilities reside in their processes and their values - and the very processes and values that constitute their core capabilities within the current business model also define their disabilities when confronted with disruption. I liked this part of the book - offers a way for managers to act. In Chapter 4 at the end. They embedded projects to develop and commercialize disruptive technologies within organizations whose customers needed them. 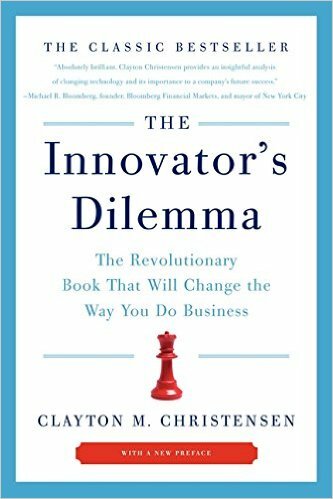 When managers aligned a disruptive innovation with the “right” customers, customer demand increased the probability that the innovation would get the resources it needed. They placed projects to develop disruptive technologies in organizations small enough to get excited about small opportunities and small wins. They planned to fail early and inexpensively in the search for the market for a disruptive technology. They found that their markets generally coalesced through an iterative process of trial, learning, and trial again. They utilized some of the resources of the mainstream organization to address the disruption, but they were careful not to leverage its processes and values. They created different ways of working within an organization whose values and cost structure were turned to the disruptive task at hand. When commercializing disruptive technologies, they found or developed new markets that valued the attributed of the disruptive products, rather than search for a technological breakthrough so that the disruptive product could compete as a sustaining technology in mainstream markets.